C-Trader Professional™ is a professional-grade trading system development and backtesting platform. It is designed: (1) to work with entire portfolios of stocks, futures, options, and spot forex; (2) to enable testing on any timeframe (e.g., one can easily test systems on 1-second bars); (3) to handle very large data sets (e.g., the entire NYSE going back 15 years); and (4), to enable complex systems that contain both longitudinal and cross-sectional rules to be easily tested and optimized. C-Trader Pro provides a level of power, flexibility, and robustness difficult to find elsewhere. It is appropriate for use by CTAs, hedge funds and professional traders. The original C-Trader was released in 2000 as companion software to the now-classic book, The Encyclopedia of Trading Strategies (Jeffrey Owen Katz, Ph.D., and Donna L. McCormick; McGraw-Hill). While the software package still contains everything required to replicate and expand the research presented in the book, it has undergone substantial evolution since its first release. Because the enhancements are quite extensive, it is now called C-Trader Professional. As the only trading system development platform used by Dr. Katz, the software is under constant development; bugs are aggressively sought and fixed, and new capabilitities frequently implemented. C-Trader Professional is reasonably priced and does not require any commitment to expensive brokerage or data services. There are no hidden fees or monthly charges, and no additional cost for live technical support—the developer himself is a just an email or phone call away. C-Trader Professional is designed to run on Unix and Unix variants (e.g., Solaris, BSD, Linux, Mac OSx). It can be run under Windows with Cygwin, an emulator that provides a Unix-like toolset and environment, some Posix compliance, and an X-Windows interface. Many TradeStation users have indicated that C-Trader is more effective for system development and testing than TradeStation. Among other things, C-Trader is far faster and more robust than TradeStation and can easily accommodate cross-sectional as well as longitudinal trading rules. Therefore, many TradeStation users opt to develop their systems using C-Trader and then port them over to TradeStation for real-time trading. C-Trader Pro can handle data sets of any size; there are simply no hard limits. For example, you can easily load and backtest a system on the entire history of tradable equity options, which amounts to several hundred thousand options per day going back many, many years! Speed matters when optimizing multiple systems on very large data sets. C-Trader Pro is extremely fast: anywhere from 20 to well over 100 times faster than TradeStation when running on a single core. And, unlike TradeStation, multiple instances of C-Trader can execute simultaneously under script control enabling you to take full advantage of cluster computing and multi-core processors! C-Trader running on a small Linux cluster of multi-core processors can achieve mind-bending terraflop throughput when optimizing multiple systems on a modest portfolio of securities. Try that with TradeStation. If you have a working knowledge of the C programming language and can read and understand the code in The Encyclopedia of Trading Strategies, then you'll find C-Trader Pro very logical and a pleasure to work with. The software even includes a searchable online manual! The software is designed to be highly modular and easily extended. By leveraging the standard Unix toolchain and other freely available software, coupled with the excellent interprocess communication mechanisms available in Posix-compliant operating systems, new capabilities are fairly painless to implement. One can even execute, control, and exchange data with other programs directly from the C-Trader command prompt or from within C-Trader scripts! You can develop and optimize systems for entire portfolios of options and derivatives, as well as for stocks, futures, and spot forex, on any timeframe from seconds to years. Even models that must select trading vehicles on the fly, such as those that dynamically choose which options on a given underlying to employ at any instance, can be implemented and tested with ease. Want to backtest a Gamma-scalping model that involves multiple stock and option positions that have to be repeatedly rebalanced and otherwise modified? No problem with C-Trader Professional; one can even make use of synthetic or modeled prices in simulated derivatives trades! Multiple systems can be tested together as system portfolios. Overlapping trades, scaling into and out of positions, and multiple entries and exits are also fully supported. The software includes a scripting language that is used for giving commands and for automating optimization and testing protocols. The commands allow you to easily load data, examine performance summaries and equity curves, run optimizations, generate graphics, even execute operating system commands and other programs, all from within C-Trader Pro! Performance summaries can now be obtained in basic or extended forms. The performance summaries display several variations on the Sharpe ratio, drawdown, net equity, average dollars per trade, number of trades, largest win, largest loss, average win, average loss, wins, losses, correlation of equity with a straight line, correlations between in-sample and out-of-sample performance over variations in system parameters, and a host of other useful statistics, some quite unique and simply not available elsewhere. The extended reports even display performance as a function of day-of-month, days-until-expiration, and day-of-week. When it makes sense to do so, all performance statistics are provided for both in-sample and out-of-sample periods. Thanks to the pager, searching, and sorting utilities found on Posix-compliant systems (Unix and Unix variants like Linux), extended summaries and other reports may be viewed, scrolled, and searched without disrupting your workflow; likewise, optimization reports may be sorted according to various criteria, scrolled, and saved to files for future reference. All of this can be done directly from within C-Trader Professional without needing to manually open files in other software applications or text editors—it is all clean and seamless, as well as extremely fast. C-Trader Professional includes a newly developed module for generating various kinds of charts using Gnuplot. The scripting language now provides commands that allow you to display a variety of high-resolution charts. These charts may even be saved as JPEGs (or in other formats) for publication, printing, or future reference. In addition, the software features a scan mode with single keystroke commands that enables you to easily scan through and examine charts for hundreds, or even thousands, of securities. All code is supplied as source and may easily be extended to provide additional charting capabilities. This code is under active development. The new C-Trader Professional makes it feasible to backtest systems that trade individual series, as well as those that trade multiple series, e.g., multiple derivatives on a single underlying with said derivatives changing from trade to trade on the basis of the trading rules. Such multiple-series situations occur, for example, when trading delta-neutral hedges, engaging in gamma scalping, exploiting skew in options or distortions between different expirations in futures, and in other similar contexts. Even systems that trade different stocks, futures, or currencies, depending on comparisons amongst them, can readily be implemented in C-Trader Pro. To provide these new capabilities, the software uses a simulation model and an architecture for defining trades that differs significantly from the original C-Trader and from other available platforms. If your model only requires trading in one series at a time, C-Trader Pro provides a translation layer that allows you to write your system in a simpler TradeStation-like style closer to that used by the original C-Trader. Trading systems can make use of both longitudinal and cross-sectional rules in all contexts. For example, if you want to implement a pairs trading strategy or an option hedging model, this is the software you need. Trading rules can involve comparisons over time (i.e., previous bars) and across tradables (i.e., different futures, stocks, or options), and these rules can place trades selectively on different tradables (e.g., options of different strikes and expirations on a given underlying). It is even possible to have a trading model that sells one option short while buying another, the particular options depending dynamically on volatility characteristics, and to have the backtest treat such combined positions as unitary trades! The package now comes with a variety of database management tools. Among these are a Yahoo downloader that can quickly and automatically retrieve end-of-day stock data from Yahoo and place it into standard comma-delimited files. Similar utilities for handling data from Pinnacle (end-of-day futures) and from Worden Brothers (end-of-day stocks) are included. With the aid of some third-party software that downloads data from Interactive Brokers into shareable comma-delimited files on a real-time basis, C-Trader Pro can even generate live trading signals and charts! The same software can be used to download historical data from Interactive Brokers on timeframes all the way down to 1-second bars for use in system development. Several utilities to store data from comma-delimited files into the software's native high-speed binary database formats are also provided; among these is a program to save raw options data from Stricknet.com in the highly compressed binary file format used by C-Trader Professional for managing options data. This latter program is so efficient that data for every equity option (well over 100,000 per day) on every stock (several thousand) in the Stricknet data set going back several years can be saved in a fast-reading file that is well under 1 gigabyte in size! Like C-Trader Professional itself, all data management tools have the ability to handle extremely large data sets efficiently. These programs all contain detailed internal documentation and are easily modified to handle other input data formats so that they can be customized to work with your favorite data sources. NEW!!! You can now even use data from TradeStation to build models in C-Trader! C-Trader Professional will soon include a component with the ability to generate real-time charts and trading signals for live trading on any desired timeframe. All you need is a good third-party "data daemon" that can run your data feed into sharable files. For users of Interactive Brokers we can recommend jTWSdump and jTWSdata . These Java utilities can download historical data as well as maintain the necessary "live" files for those who use Interactive Brokers TWS as their trading platform. C-Trader Pro and jTWSdata make an unbeatable combination for high-speed scalping and day-trading. A library containing tightly-coded Black Scholes option pricing and implied volatility models for puts, calls, and straddles, as well as numerous functions for calculating historical volatility. Historical volatility calculations include standard close-to-close, exponential close-to-close, Parkinson's, and all others mentioned in the book Advanced Option Pricing Models (Katz and McCormick; McGraw-Hill, 2005). The option pricing and historical volatility routines are packaged together with test programs that illustrate their use and verify their proper operation. Multiple functions, libraries, and C++ classes for wavelets, filter banks, spectral (cycle) analysis (including Mesa), Fourier transforms, data smoothing (e.g., Savitzky-Golay), liquidity assessment, pattern recognition, FFT-based filtering, not to mention convolution and deconvolution. Extensive statistical libraries that include the gamma, log-gamma, incomplete Beta, and reverse incomplete Beta functions, as well as as wide variety of functions for working with probability distributions including, but not limited to, the F, Chi Square, Student's, and Normal. Many related mathematical routines are also included, such as routines for evaluating polynomials, determining greatest common divisors, and generating quality psuedo-random numbers. A C++ genetic optimizer class that includes everything required to perform full-blown genetic optimizations. A comprehensive, numerically stable, and very fast neural network library. It is one of the libraries used as the basis for the N-TRAIN neural network development application. Component-oriented, highly optimized and extremely fast libraries for handling the various binary data formats used by the software, e.g., the compressed binary options data format and the general stock and futures data formats. Library of routines for portable keyboard handling under Unix and Unix variants, Dos, and Windows, that replace the not-so-portable getch() and kbhit() familiar to old-time Dos programmers. Complete programs for performing factor analysis that implement some of the most advanced rotational methods available, including Harris-Kaiser Orthoblique, Varimax, Oblisim, and Primary Product Functionplane. Factor analysis is useful for characterizing the clustering and correlations within a universe of futures or stocks (or a specific portfolio) as described in the chapter on factor analysis in How to Start Day Trading Futures, Options and Indices (Katz and McCormick; McGraw-Hill, 2001), and hence for assessing covariation risk and diversification. A script interpreter for the program's scripting language which interprets commands placed in scripts or entered at the command prompt is part of the system. The code for the interpreter is well documented internally, and new commands may be painlessly added with a few lines of C++. A complete component-oriented library for multiple regression designed to handle exceptionally large data sets (think millions to billions of data points) quickly, easily, and with reasonably good numerical stability. A wide variety of date and time routines for determining, amongst other things, days remaining till expiration, seconds since midnight, seconds between two date:time pairs, Julian day numbers given yyyymmdd dates, and yyyymmdd dates given Julian day numbers. The software even includes routines to read the computerized interactive emphemeris data from the Jet Propulsion Lab! A collection of routines for efficiently sorting, indexing, and searching arrays and data structures. 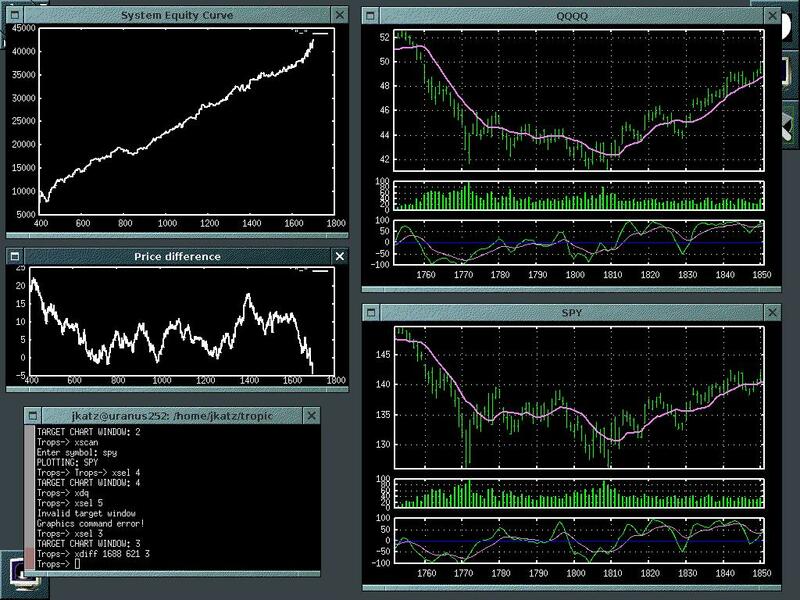 An extensive collection of standard technical analysis functions including many indicators, more than six types of moving averages (e.g., adaptive and triangular moving averages), standard deviations, Bollinger Bands, Wells Wilder's ADX (coded properly), rolling correlations, trendline values, automated trendline detection, Lane's Stochastic, the MACD and CCI oscillators, and other items of the kind found in magazines such as Technical Analysis of Stocks and Commodities. The software is heavily documented internally, with detailed comments and explanations embedded in the source code. There is also searchable documentation, including a users manual (online for Unix, Linux and Mac users; Windows users without Cygwin will need an external text editor to read the documentation). The software comes with examples that illustrate how trading systems are implemented and tested in C-Trader Professional. You can run these examples, optimize them, and modify them to get a feel for developing your own strategies using this platform. Among the examples are a simple moving average system and a simple delta-neutral hedging strategy with simulated Black-Scholes option prices. The software is supplied as source (generic ISO-standard C and C++). It may be compiled to run on any Posix-compliant (Unix or Unix-like) operating system with the standard GNU toolchain and well-respected GNU compiler suite. An X-Windows system (standard X11) and Gnuplot are required for graphics. Other tools and utilities usually present on Posix-compliant systems (e.g., wget, sort, less) are required for other features (e.g., downloading data from Yahoo and displaying certain reports). C-Trader Pro will run on Windows when compiled with the GNU compiler suite under Cygwin (the suggested way to run the software in Windows) with X-Windows, the GNU compiler suite, and Gnuplot installed. It can also be compiled as a native Windows console application using the Digital Mars and MS VC++ compilers, but then many features, e.g., graphics, will not work. The software will compile and run on all Intel-type hardware (AMD, Cyrix, Intel) with at least 256 MB memory and a few gigabytes of disk space. Disk and memory requirements beyond the minimum depend on your data. The price, for the complete package (which includes all source code and six months of free upgrades) is $499.00. NYS residents: please add sales tax for your county. As with all of our software, you will be purchasing a single-user license that entitles you to install the software on two machines for your personal use. Once you order, you will be provided with a password that will enable you to immediately download the software and sample data from our ftp server. You will receive free upgrades for a period of six months. The software is under active development, so the upgrades will be significant and not just occasional bug fixes (although you will receive those as well)..
Payment may be made via Paypal (to the account of katz@scientific-consultants.com); for fast and easy Paypal payment, click here. We also accept Visa, Mastercard, American Express (please call 631-696-3333 or email us your account number, expiration date, and contact information). Payment by check or money order is also acceptable (make payable to Scientific Consultant Services and mail to the address below).